Start the spring color show early in your garden with a variety of early blooming perennials, shrubs, and trees. From Witch Hazels, which blossom in late winter, and Hellebores, which generally flower before the last of the snow has melted, to Virginia Bluebells, Brunneras, and Magnolias, there are countless ways to incorporate a rainbow of rich colors into your spring planting schemes. What better way to celebrate the arrival of a new growing season? The best antidote to winter is a planting of Witch Hazels. This genus of 5 species of upright, spreading shrubs or small trees provides the first big display of color, beginning in late February or early March and continuing for 6 weeks or more depending on the season (the flower petals sensibly curl up if the temperatures plummet). For an even earlier display, cut some branches in January and force them into bloom indoors. Plants thrive in average, well-drained soil. 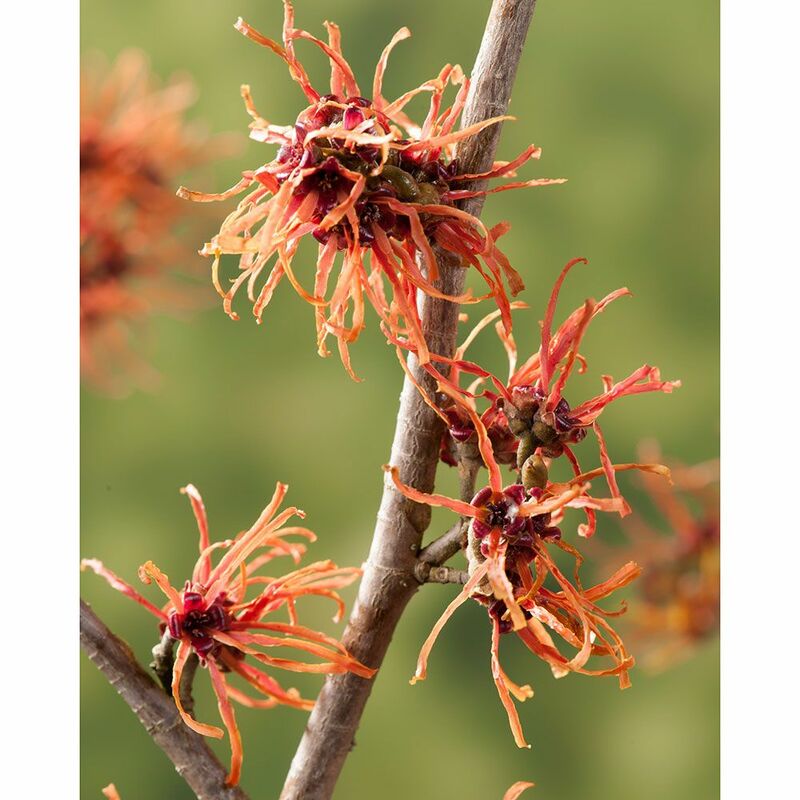 We love Witch Hazels for the color they bring to winter gardens and for their hardy, problem-free nature. ‘Jelena’ is a favorite, with large ribbonlike petals that gleam coppery orange. In autumn, the shrub lights up again as its matte green leaves turn fiery shades of red and yellow. 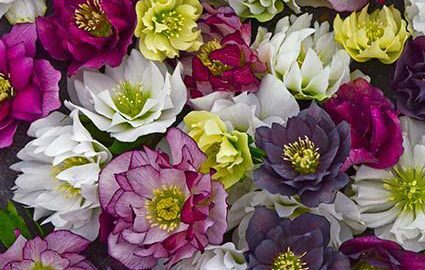 Hellebores are considered aristocrats of the woodland garden. Native to Europe and western Asia, the genus contains about 20 species of perennials that bloom in early winter in mild climates and in late winter or early spring where the soil freezes hard, which makes them either the last or the first flowers in the garden. In our gardens here at the farm, they are among the first plants to bloom, bringing a splash of color to the late winter garden, sometimes blossoming amid the last of the snow. They require a moist but well-drained site under the shade of trees. Take care to amend the soil with plenty of organic matter, such as well-aged leaf mold and compost. You’ll be rewarded with long-lived, deer- and vole-resistant plants that will spread nicely on their own. 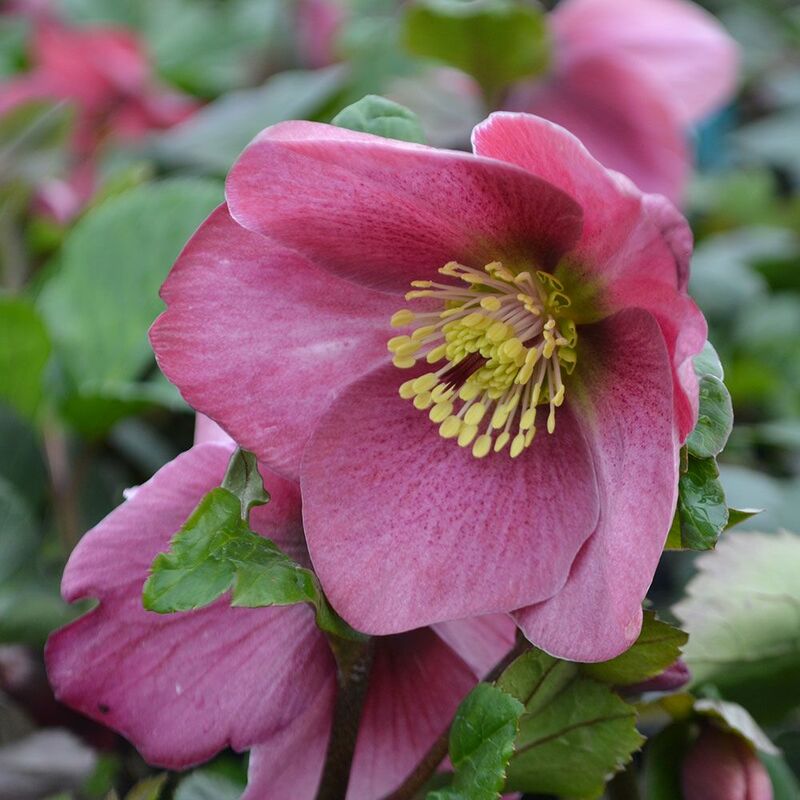 Hellebore Gold Collection® ‘Madame Lemonnier’ is a large-blossomed beauty that was discovered by a gardener in Normandy, France, where her passion for growing Hellebores turned into a full-fledged hybridization program. The plant’s 3″ upfacing blooms are rich purple red, and are held above lush green foliage on tidy, clumping plants. Under greenhouse conditions at the nursery, many of these impressive blossoms exceeded 4″. A magnificent addition to shade gardens. It is impossible to live in a northern climate and be unfamiliar with Forsythia. The durability, vigor, and abundant yellow flowers of this early bloomer make it one of the most popular and important ornamental plants known. 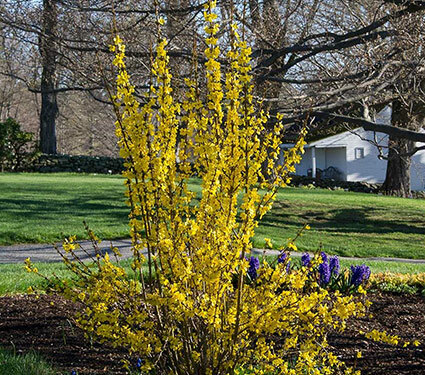 Forsythia Show Off® is perfect for a tight hedge or a specimen in a border. From France comes this compact variety whose golden flowers are brighter, larger, and stacked closer along the stems from soil to tip. Another bonus is the dark green foliage. 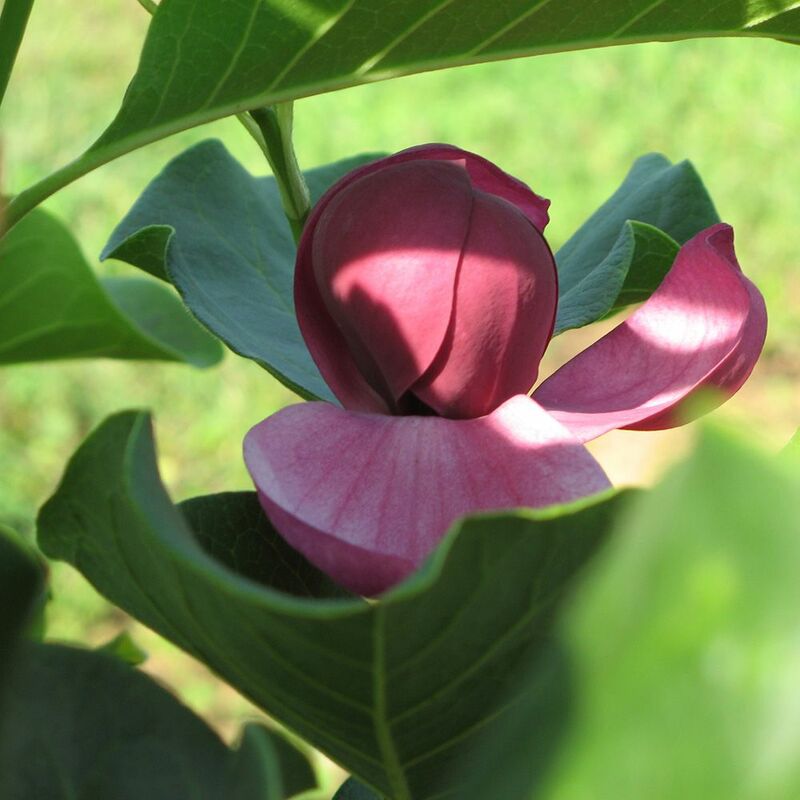 Magnolia is a genus of over 100 species of trees and shrubs widely distributed from the Himalayas to East Asia and in the Americas. Introduced Japanese and Chinese species and their hybrids, such as the showy white Star Magnolia and the pink Saucer Magnolia, draw the most attention in spring. The handful of species native to Eastern North America include the magnificent, evergreen Southern Magnolia (M. grandiflora), Sweet Bay (M. virginiana), and the large Cucumber Tree (M. acuminata). Magnolia ‘Genie’ is a fairly compact variety, growing 12–15’. In early spring, lightly fragrant, 6″ cupped blossoms appear on slender branches, like goblets of burgundy. A second, lighter flush of bloom arrives in midsummer when provided with full sun and adequate moisture. Bred in New Zealand, this slender, well-branched variety blooms for a longer period, even when young. An ideal small tree to feature alone, in pairs, or to put the finishing touch on a mixed border. A friend of ours once referred to this charming plant as “prompt” because of the way its beautiful silvery green leaves break ground quite early in spring. They’re followed by a haze of tiny azure flowers, which give this plant one of its nicknames, False Forget-me-not. (It’s also sometimes known as Siberian Bugloss and Heartleaf Bugloss.) Brunnera is most at home in woodlands or along shady stream beds, where it will form a lush understory of quiet beauty. 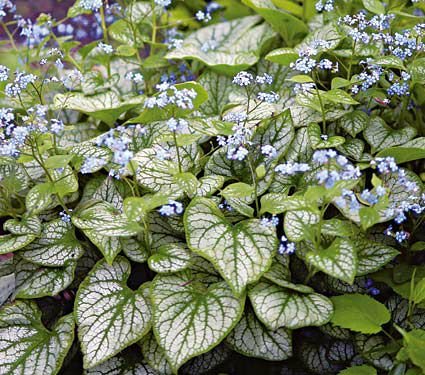 Brunnera ‘Jack Frost’ is a standout variety with frosted leaves veined and outlined in green. The plants grow to 12″ tall and as wide, and while the blossoms provide a fleeting show, the foliage looks superb all season long. 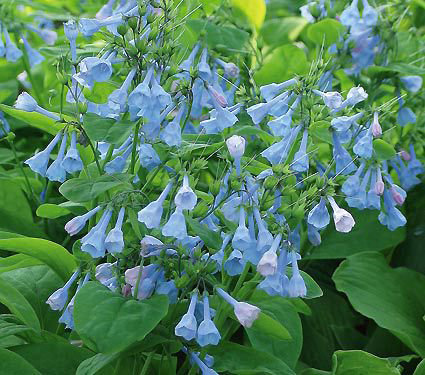 Everyone loves Virginia Bluebells (M. virginica) for their sapphire blue flowers on 18″ stems that gleam from shady spots in April and May, making them an ideal underplanting for shrubs and trees. Plants thrive in deciduous shade and moist soil, where they will seed themselves to create a charming colony. Trilliums are spring-blooming wildflowers much prized by woodland gardeners for their delicate, 3-petaled flowers and distinctive foliage. 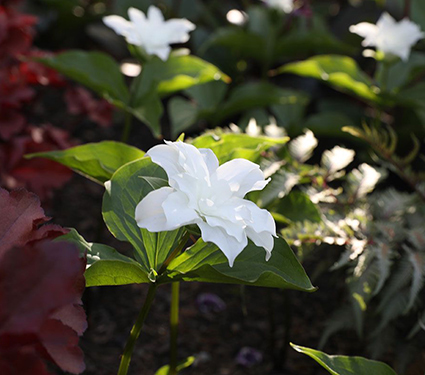 Trillium grandiflorum ‘Flore Pleno’ is an exquisite double form that produces pure white flowers in April and May, which will enchant you and all visitors to your garden.